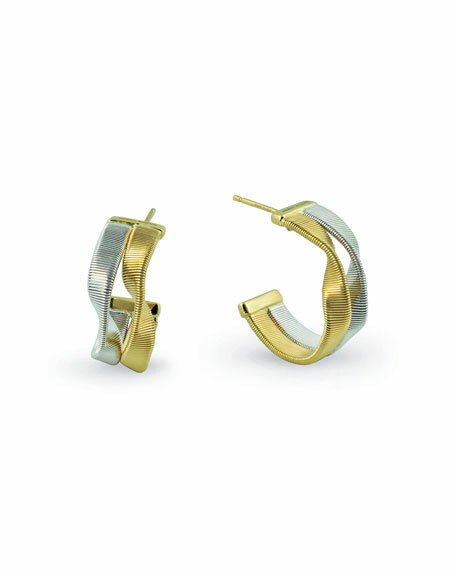 Marco Bicego two-strand hoop earrings. Hand-twisted 18-karat yellow and white gold. EXCLUSIVELY AT NEIMAN MARCUS With every purchase Akola reinvests 100% of profits to empower women and families in poverty. Akola teardrop hoop dangle earrings. 18-karat yellow gold-plated brass. White quartz and disc dangles. Post backs for pierced ears. Approx. 3"L drop. Made in USA. Orbit wavy hoop earrings by Alexis Bittar. Gunmetal and 10-karat gold plated brass. Wavy hoops with clear crystal accents. Post backs for pierced ears. Approx. 1.6"L; 1.5"W.